The start of a new school year usually means the start of new small groups, the start of soccer games, the start of PTA meetings, and the start of a busy season for parents. This is a perfect time to reactivate parents, so kids at every phase will stay connected to them. Regardless of how much a church learns about life stages, parents know things no one else knows about their own children. That’s why parents have an advantage the church will never have related to the future of a child. A parent has history. Just remember, no scientist or theorist or expert can really know a child the way their own parent does. That being said, churches know something parents don’t know. Churches work with multiple kids in the same phase every week. That means churches can help parents understand general characteristics of a phase so they can readjust their parenting skills. Create a content calendar with everything you want parents to know. Organize a plan to cue parents weekly with key information when they need it. Recruit leaders to connect with every parent, especially those who never show up. The point is kids are changing fast, and it’s more important for parents to stay connected than anyone. Each phase has an estimated number of weeks left until the average kid leaves home. These weeks are an important reminder that: Parents are not really raising children. They’re raising adults. 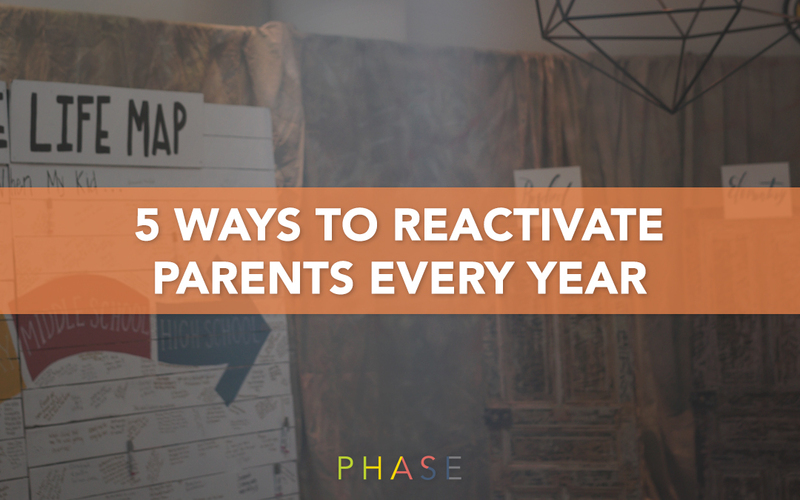 It’s important to reactivate parents every year so they understand the phase of their child. It may be just a phase, but when you don’t miss it, you do more than just help kids. You make sure parents don’t miss it.